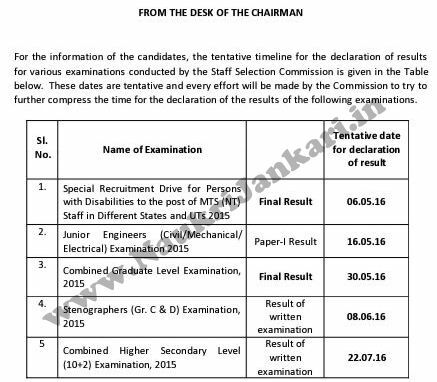 Staff Selection Commission (SSC) has released the tentative schedule of recruitment exams that were held in 2015. This is about the tentative dates of result of various examinations conducted by SSC in 2015. This schedule is tentative and SSC will try their best to publish the result of the exams on the scheduled dates. Now you need to wait for the dates. Good Luck! 0 comments for " Result of SSC Exams 2015: Tentative Dates "